I half joked that I felt like I was about to be an empty nester. What would I do without my kids all day? Who would I go adventuring with? Who would provide some background noise and millions of distractions to me all day long? More than that, though, I worried. As moms, that’s just par for the course, right? Would Kindergarten be kind to them? Would they make new friends they loved just as much as their friends from preschool? Would they feel the need to conform and lose their unique, free-spirited personality and ways? As we walked the half mile to school that morning, I fought back tears and instead talked about how great their day would be. They lined up, we kissed them goodbye, and off they went without even looking back. Instead of utter sadness, I felt pride. 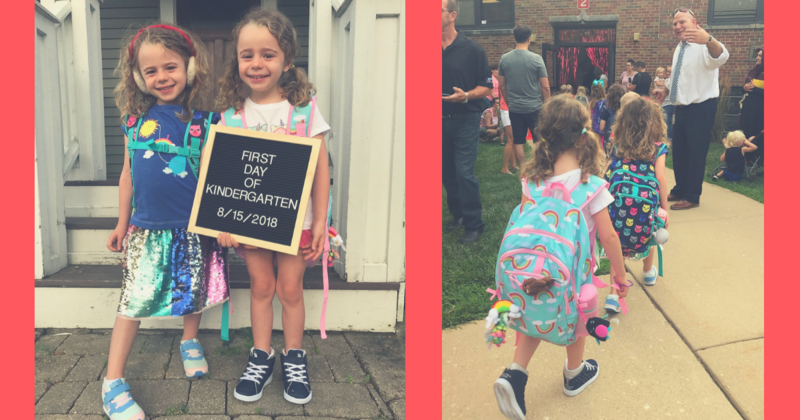 They were so brave to do something so new—new people, new school, new hours, new bedtime, new everything. And they were EXCITED! Not scared, or sad, or worried. How could I feel anything other than complete amazement in how much they have grown and how brave they were? Sure, the house is MUCH quieter than before and there are days that I wish they were home so I could whisk them off somewhere fun where we could all run around and play all day. But in this one month of Kindergarten so far, they have flourished. And while their favorite fashion accessory, ear muffs, have to stay off during the school day, they still stay close by in the backpack. Some things will never change. Mama, how did your Kindergarten drop-off go?